The Cleburne High School 4 X 800 girls relay team came away from the Texas Relays with a memorable moment that has inspired a new attitude. 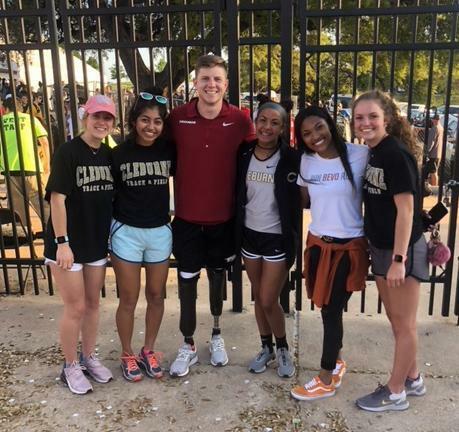 At the national meet held at The University of Texas, Lady Jackets Chloe Reed, Maggie Marshall, Hannah Marion and Samantha Moreno crossed paths with University of Arkansas sprinter Hunter Woodhall, who was among the college competitors in attendance. Woodhall is the first double amputee to earn a NCAA D1 scholarship in track and field. Woodhall was diagnosed at birth with a condition known as fibular hemimelia, in which the fibular bones never form. He had only nine toes and one of his feet curved inward. At the age of one, doctors amputated both of his legs below the knee. Three months later he received his first pair of prosthetics. As a senior at Utah’s Syracuse High School, Woodhall broke the state record in the 400 meters. Now a sophomore in the Razorbacks track program, he also competes for TEAM USA and is preparing for the World Para Athletics Championships, following a silver medal finish in 2016 as the youngest competitor in attendance. Marshall, who has seen Woodhall compete at an indoor meet, describes the encounter with the world-class athlete as most memorable. Woodhall has often been quoted as saying “They told me I would never walk, so I learned to run instead.” His average time in the 400 meters is 47 seconds. Marshall, who has battled injuries as a distance runner in cross country and track, said Woodhall serves, for her, as an example of what perseverance can do. Girls Head Track Coach Patty Foster said the chance encounter with Woodhall was a teaching moment for her athletes. Foster says taking student athletes to a major event like the Texas Relays can lead to inspiring moments that last long after the race is over. Qualifying for the national meet was a goal Marion set as a freshman competing on the JV team. That’s the story Foster hopes to hear from all her students. Following field events on Wednesday, Cleburne’s participation in the 14-5A District track meet continues on Friday, at Joshua High School. Those finishing with top placings will advance to the Area meet.